We’d love your help. Let us know what’s wrong with this preview of The Stolen Herd by K. Madill. Mandamus is only a foal when his herd is captured by the terrible Rakhana Army . Rescued and raised in secrecy, he knows nothing of his heritage until a dreadful incident in the woods brings him to the attention of the Forest council – and everyone else. Sent away for his own protection, he is determined to seek help on behalf of the many animals who have gone missing from Mandamus is only a foal when his herd is captured by the terrible Rakhana Army . Rescued and raised in secrecy, he knows nothing of his heritage until a dreadful incident in the woods brings him to the attention of the Forest council – and everyone else. Sent away for his own protection, he is determined to seek help on behalf of the many animals who have gone missing from the forest, including his own family. To ask other readers questions about The Stolen Herd, please sign up. A copy of The Stolen Herd was provided by the Author. I was not obligated to write a positive review. This is my full and honest opinion. Cover Blurb: Yes or No? It is a gorgeous cover; I really like it, with the purple and the stars and the midnight-black horse. Very pretty and exciting! Characters: It took me a little while to fully like Mandamus. He wasn't a bad protagonist - intelligent and kind-hearted, but he also behaves pretty young, and I just wished he would display some maturity. As the A copy of The Stolen Herd was provided by the Author. I was not obligated to write a positive review. This is my full and honest opinion. Characters: It took me a little while to fully like Mandamus. He wasn't a bad protagonist - intelligent and kind-hearted, but he also behaves pretty young, and I just wished he would display some maturity. As the story progresses, he grows, which I figured he probably would. I really liked Luco, though I had a hard time figuring out what age he was supposed to be - until he got around his family. Now I'm guessing he's supposed to be about early twenties? Late, late teens? Arkis, the fire bat, also took some getting used to. He has a bad temper, but I did end up liking him. Probably my favorite character, though, was Gideon - the shapeshifter. He wasn't in this book nearly enough, in my opinion. Shapeshifters are automatically given the awesome status simply because of what they can do, but Gideon was doubly awesome. A rather mysterious figure that knows more than he's saying, who is overseeing everything that's happening to fulfill the prophecy, and the sworn - and especial - enemy of the queen. Yeah, he's just awesome. There's more to him than we know; a very long history. We don't get to meet the queen for very long, but the brief time we do see her, she leaves a fairly intimidating impression. The Romance: There isn't any beyond Luco falling in love with Lethe. But it doesn't take up much of the story. Plot: Humans and animals have always lived in relative peace. Humans and animals often formed Bonds with one another, and horses shared companionship. Until Queen Asura took the throne. Now, the Rakhana Army has been rounding up horses and forcing them into service. Bonds of old are forbidden, and the Queen is slowly enslaving the animals. Mandamus is the only foal of the Alsvid horse tribe to escape capture, and now he is hiding among the Harena. For there is a prophecy about Mandamus, and the Queen will stop at nothing to stop its coming true. But prophecies have a tendency of fulfilling themselves, and it isn't long before Mandamus finds himself on a journey to find his destiny and save the kingdom. This is the first book in a series, and it definitely feels like one. There's a lot of setup for the rest of the series in this one; introducing characters, situations, et cetera. It's a short read, so it doesn't drag. My main complaint is the world building. It's well done, but it's also a little confusing. I wasn't sure if the world was supposed to be futuristic, fantastic, medieval, or modern. There's trains and other references to modern equipment. But there's also a very fantasy-world-ish feel to the whole world and styles. So, yeah, a little confusing. I loved the Author's fantastic creatures, though, and the general idea of the world. It was a lot of fun. Writing Style: Third person, past tense. It fits a Middle Grade age range, and she had very good descriptions. Sometimes the dialogue was kind of too modern for my liking, but overall I thought it was a pretty good style. Conclusion: It ends with a definite promise of a sequel, where more things will probably happen. The latter part of this book is mostly spent with Luco's family, learning about their peculiar ways, eating, playing music, and eating some more. And Luco's trying to learn how to ride Mandamus. It dragged a bit, but like I said, this is so obviously the beginning of a series, and the Author has enough promise of what will happen next that it keeps the book from dragging. The Stolen Herd is a very short read, but enjoyable. It's got some good characters, a good plot, and an interesting world - even if it's a little confusing. I found it to be a very diverting little read. The very best thing about this book was the cover. Sadly nothing else about it worked for me. A "talking animal" story (horses), but the characters all might as well have been human. They spoke just like people, they knew everything people knew (like what a galaxy is), they had a queen and politics and such... Just completely not for me. Stopped at 6%. Beginning to end, Karai Madill’s “The Lost Herd” is a wonderful young adult adventure and coming of age story, with beautifully drawn characters that engage and delight the reader. While the genre of young adult fantasy might put some readers off, Madrill easily crossed the age gap with a well-told story that is open to readers of all ages. Madill’s story is the fantasy adventure of Mandamus, an foal parted from his herd when they are captured by the Rakhana as slaves. Mandamus grows up under the guidance of Mareva a queen and Daleth, her general, two strong mares who lead and guide their herd. Mandamus isn’t aware of his true origins until the day he accidently “spies” on a princess of the Night Mares, a nomadic herd or dangerous mares. Although innocent, Mandamus must flee the Night Mares queen’s wrath. Along his way to find a herd of bachelor stallions, Mandamus comes across a man, Luco, who agrees to aid him and befriends him through the dangers of the wide open world. Mandamus's true identity has been kept from him - he is the last free Alsvid. The rest of his herd is either dead or in forced servitude to the Rahana Army and Queen Asura. But all the secrecy surrounding Mandamus's existence is about to revealed one fateful morning and he will be sent on a mission that will lead him to his destiny. Someone or something is decimating the various animals - they are just disappearing or being killed. The Forest Council that helped hide Mandamus feels that for his protection Mandamus is the best suited to discover what is happening. But nothing ever goes as planned especially when there is a prophesy involved. Be prepared to meet the unexpected in The Stolen Herd. 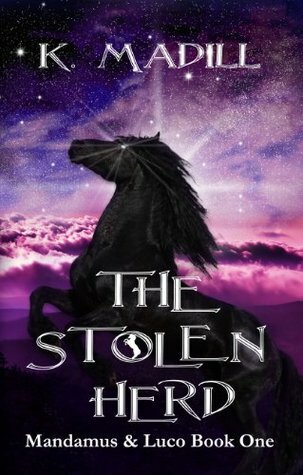 The Stolen Herd is a unique blend of originality with known mythology and ancient tradition for a story that will both enchant and move you. And do have a tissue or two handy - there are a couple of scenes that may move you to tears (as they did me). This book is for a YA audience but I think other ages (tweens and adults) would enjoy this book as well. The length makes it a perfect week-end afternoon read.